Macy’s Thanksgiving parade, an annual event held on Thanksgiving Day in November. Attracting more than 3 million visitors each year and 50 million spectators watching live on TV. The parade showcases floats, marching bands, cheerleaders and of course the famous giant balloons of characters such as Spiderman, Mickey Mouse and Hello Kitty. There are more than 8,000 volunteers working the 4km route. 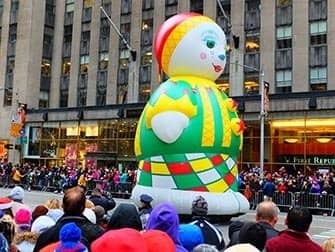 If you are in New York in late November, then you simply cannot miss the Macy’s Thanksgiving parade. The Thanksgiving parade itself is not the only spectacle: on the eve of the parade, you can see the giant balloons being inflated. This happens in designated areas near the American Museum of Natural History in the Upper West Side. You’ll need a lot of patience to get close to this area. Fences are put up to create rows so that everything moves as smoothly as possible. The inflation of the balloons always attracts a lot of people, so be prepared for busy roads and long queues. The queue starts normally at 79th Street and Columbus Avenue and at around 15:00. The area is open to the public until 22:00. 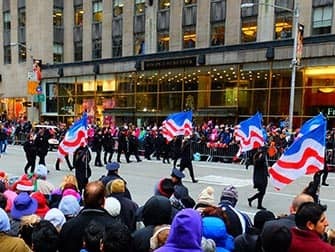 On Thanksgiving Day at around 09:00 the Macy’s Thanksgiving parade commences on the west side of Central Park at 77th Street. The parade then continues down 6th Avenue towards Herald Square on 34th Street, where the Macy’s department store is located. As early as 06:00 people line up alongside the route to make sure they have great spots for viewing. So, if you want a place alongside the route too, you better get there as early as possible. Sometimes parts of the streets are closed off to avoid overcrowding. If you can’t find a spot alongside the route, try walking a block further. The balloons are so big that you’ll have no problem seeing them from a distance. Where to view the parade? For the best view of the parade head to Central Park West between 60th and 70th Street. It is busiest around Herald Square. It is not recommended to watch the parade anywhere between 34th and 38th Street as this is where the national television broadcast will take place. 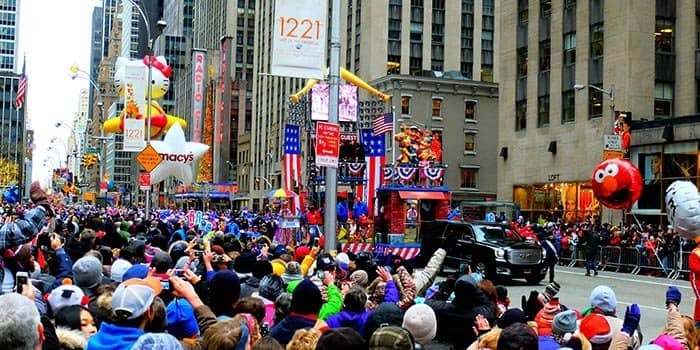 Before you head out, make sure to check the special Macy’s Thanksgiving parade website for the most recent information, the route and times – because these are subject to change. 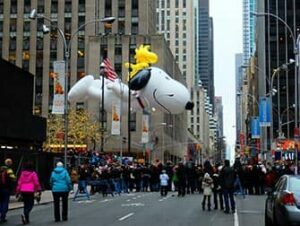 Eric’s Tip: If you haven’t been able to see the balloons up close the day before the Thanksgiving parade or on the day itself, you still have a chance; after the parade the balloons are deflated around 34th Street and 6th Avenue.